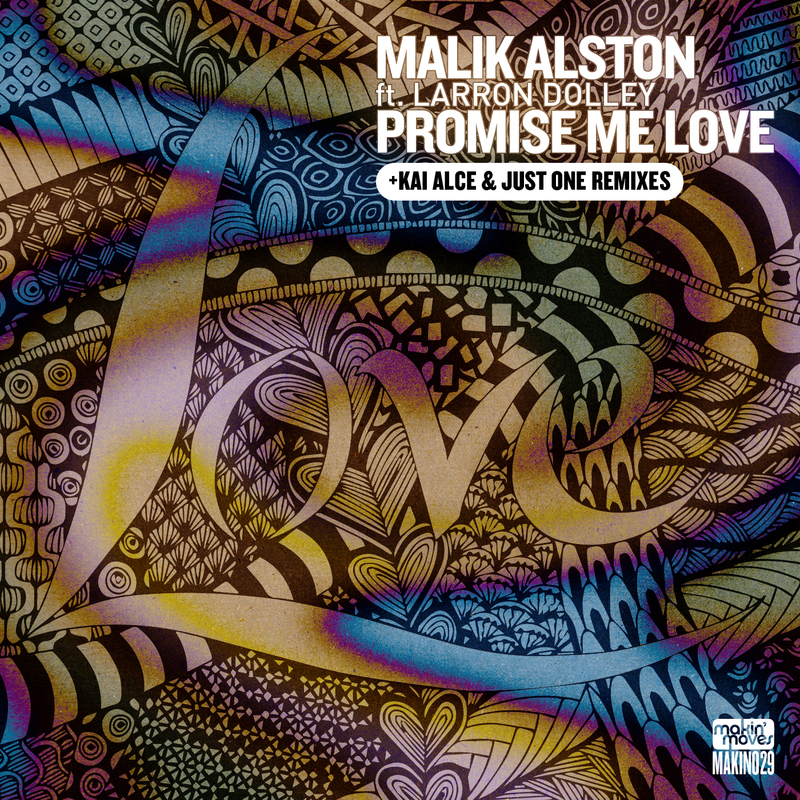 Makin’ Moves are proud to present a new artist to the label, Malik Alston hailing from Detriot with his first single release Promise Me Love featuring the wonderful dulcet tones of LaRonn Dolley on vocals which includes remixes from Atlanta’s man of the moment Kai Alce and a hot broken beat mix from Just One. Malik Alston is one of Detroit%u2019s premier DJ%u2019s, producers, performers, vocalists and improvisationists. Malik was influenced as a DJ by the groundbreaking radio show of the Electrifying Mojo, and the eclectic radio show of jazz aficionado Ed Love. The creativity of DJ/producers Kenny Dixon, Jr., Norm Talley, Craig Huckaby and Rich Medina has inspired Malik%u2019s style on the decks. As a pioneer in electronic dance music, he produces and spins without boundaries, often fusing a multitude of styles to create a new innovation in sound. Malik%u2019s use of keyboards, voice, effects and composition sets a new standard. Malik has written, produced and remixed for many artists, including LaRonn Dolley, Marissa Guzman, Craig Huckaby, Rich Medina, Alton Miller, Adesola Osakalumi (principal lead, as FELA! ), diamondancer, Recloose, Ray 7, John Arnold, Roy Davis, Jr., Pirahnahead plus many others. Malik is the CEO of his label, Truth Manifest Records, founded in 1997. He continues to be a creative vessel and convey passion in his music, with new and exciting projects soon to be released on Truth Manifest. He has released several well-received projects, including Beyond Jazz, Lost Files: The Beginning, This Music Is Life, Tuxedo Sessions, Dinner Music, Conscious Exposure and Malik%u2019s Mind (Truth Manifest Records); Caterpillar EP (Third Ear Recordings), Butterfly on Beatdown Sessions Series Volume One (Third Ear Recordings). Classic singles from Malik%u2019s repertoire, among many favorites, include Badeya, Back 2 Chicago, In A Better Way (Change) and Inside. Produced by Malik Alston, written by Malik Alston & LaRonn Dolley. Remixed by Kai Alce / Remixed by Just One. Lead Vocals: LaRonn Dolley. Background Vocals: Malik Alston, Badriyyah Wazeerud-Din. Under licensing from Truth Manifest Records. For a limited period you can now purchase the 12’ vinyl of our big summer hit ‘Ding Ding’ featuring UK soul sensation Omar on vocals, produced by Hallex M and DJ Fudge which include the remixes from Chicago legend Glenn Underground and Art of Tones all on one record! DJ Fudge has long been a force in the house music scene since his Trouble Men days on the well-respected Kif Recordings and alongside his good friend Hallex M has carved a notch in the new breed of rare talent over the past years. Both guys had longed to work with UK soul legend Omar Lye-Fook. And late last year their dream came true when Omar visited Hong Kong where Hallex and DJ Fudge both currently reside and there they worked on some tracks we heard about the collaboration and snapped up ‘Ding Ding’! ‘Ding Ding’ is an instant dance floor filler! Omar delivers a stellar performance, the various remixes of the track have been big in many djs box this summer and now you can grab this special 12’ version! Makin’ Moves continue to light up your dance floors this winter with a hot slice of soulful house from Chicago legend Glenn Underground, inspired by another Chicago legend Gene Hunt. We’re very excited to have Glenn on board for this exciting release following his smoking remix of ‘Ding Ding’ this summer, which is still buzzing on dance floors around the world. My Life comes with CVO and a Dub Mix from Ricardo Miranda. Ricardo also from Chicago has released many tracks on Glenn’s label Strictly Jaz Unit. His music has been charted on endless playlists under the Latin Soul Brothas, Yonurican, and of course Ricardo Miranda. Glenn was raised on a diet of disco classics and freeform jazz of 70s Chicago, where house music was born. Taking inspiration from pioneers Larry Heard, Ron Hardy, Lil‘ Louis. Glenn has produced some of the most respected deep house music for Cajual, Prescription Guidance and Peacefrog. Exclusive promo from Traxsource.com on Tuesday 4th November. All other sites 2nd December 2014. Makin’ Moves return to Shoreditch for our final party of the year. Trapeze basement is the venue, formally East Village, the perfect space with great sound and floor for dance and expression til the small hours. Residents Matt L-S and Jamesey are back on deck duties and for this very special event we’re flying in our good friend Tyrone ‘Mixologist’ Francis from New York for a 3 hour set.